If you are simply using your CRM as your online database of contacts, you’re doing it wrong. Of course, a CRM is great for storing contact information in an organized way, but it does SO much more. It is designed for so much more than being an online information locker, especially integrated software like GreenRope. Organize Automate Workflows: Customize your workflows and let them automatically guide your sales process. By triggering automatic workflows, your sales team is alerted when tasks/activities assigned to them are due. This saves your team time by automatically inputting preset tasks and activities to be completed. View Reads & Reads: Email campaigns are a key element in digital marketing. However, if you are going to email, you better track your efforts. Analyze who is opening your emails, what recipients clicked on, what browsers they used to view your emails. All of this information is not only good for evaluating the success of your campaigns, but also for obtaining important information about your contacts’ engagement with your brand’s campaigns. Automate your Marketing:Automate your marketing with auto-responders and drip campaigns. Automation lets your nurture your leads in an efficient and effective way. Auto-responders are emails that are automatically sent to a contact that has filled out a signup form on your website. Say goodbye to manually importing contacts into your CRM, and sending one time emails each time someone inputs their information into your forms. Organize Contacts Engage Socially:Post to all of your social networks, find engaging conversations, and track your social efforts with an integrated CRM. Social media is no longer an ‘extra’ item, it must be part of your digital marketing campaign. It is important to get the whole scope of how your contacts are reacting and engaging with your brand. Knowing how they engage with your over social media, and what they are saying about you gives you a lot of insight into that contact. Use this information to build a better relationship with your clients both on and offline. Organize Capture Leads:Capture leads with integrated and easy-to-use signup forms and landing pages. Once a person enters their information into a signup form they are automatically dropped into your CRM, and can start being sent drip campaigns, trigger workflows, etc. This integration alleviates the need to manually enter a contact into your CRM. Score Leads:The ability to score your leads lets your sales team know which of your contacts are hot-to-trot. The more points they acquire the more likely they are to convert. Any complete CRM (GreenRope) has the ability to set your scoring model based on activities, behaviors and demographics. Save time and increase your sales by knowing who is most likely to convert ahead of time. Predictive Analytics:Predictive analytics is a rather new feature; GreenRope remains the only out of the box CRM to include this feature at no extra charge. Predictive analytics take your lead scoring, as well as data from past conversions and automatically predict which contacts in your CRM are most likely to convert at each stage of the buying process. Again, save time and increase revenue by focusing on the contacts most likely to purchase first. 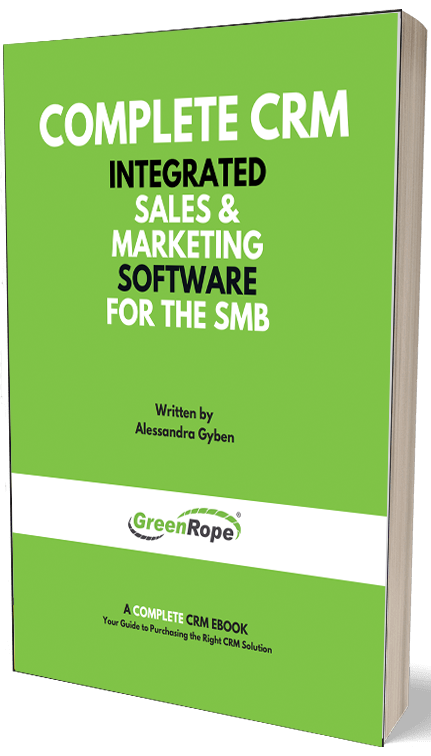 With integrated platforms, like GreenRope, your business is able to rise from sales mediocrity. Instead of focusing on your company’s offerings, a CRM with the features above lets you concentrate and address what is important to your customer. It’s a better way of selling, don’t you think?